Fellow earthlings, take precautions, watch your language, while incinerating “protein patties” in your outdoor backyard living space this weekend. You never know who could be listening. Don’t forget to procure the “starched planes,” (hamburger buns), on which to place said “protein patties,” and lay in mass quantities of your favorite chilled beverage. Although, “Beldar,” patriarch of the Conehead family unit, preferred “Blatz” beer–it’s really your choice, fellow earthlings. I am speaking about gender-specific terminologies that succinctly describe how components fit together and their relationships to each other, without using a bushel basket full of words. To change nomenclature would be a crime. I would be highly offended–if anyone cares. 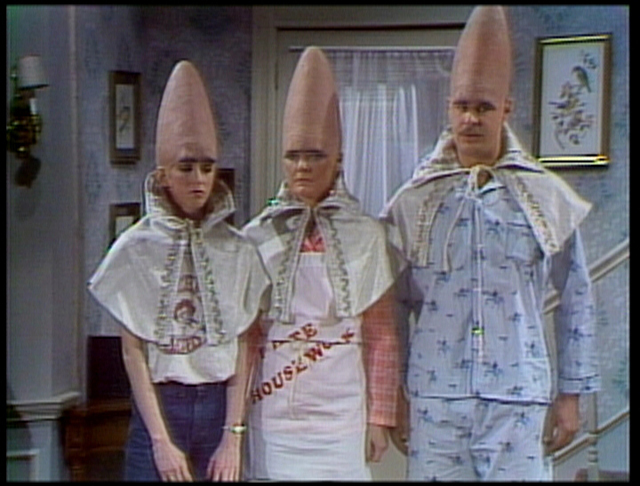 The Coneheads are just proof positive that extended vocabulary can be utilized for humorous purposes. I approve. It is true! Freedom of speech is being overwhelmed by fear of speaking and accidentally saying the “wrong” thing. We fear now that we will offend our neighbor, the teachers, the store cashers, the pizza boy (did I really say that?? ), and even other family members. The very worst is the way the word ‘Christmas’ has been virtually eliminated from the American English vocabulary. It is now ‘Seasons Greetings’ or ‘Happy Holidays’. BAH Humbug! !